In general, the idea is that I assign one broker queue to one scheduler so that the semaphore is controlled by MAX QUEUE READER and there will be no interference between schedulers if one scheduler takes more threads. The quantum will be controlled by SQL Server Engine. Let’s only talk about a simplified scenaro in this blog post – one scheduler. We are going to use only a ver important feature in service broker — the receiving order of messages within a conversation is same as the sending order. Will this mean we can only have one thread at target (activation procedure) side? If you activation procedure is designed in the way that entire procedure is running in a transaction, the messages will be processed sequientially regardless the value on MAX QUEUE READER. But if you process your message processor is designed in this way, the situation changes. Once the transaction is committed, next message will be received by other activation thread while the prior thread is doing “Your Work”. The solution has been figured in my previously written post , Locking and Blocking (11) – Process Control and Customized Locking Hierarchies. We are going to use application locks. 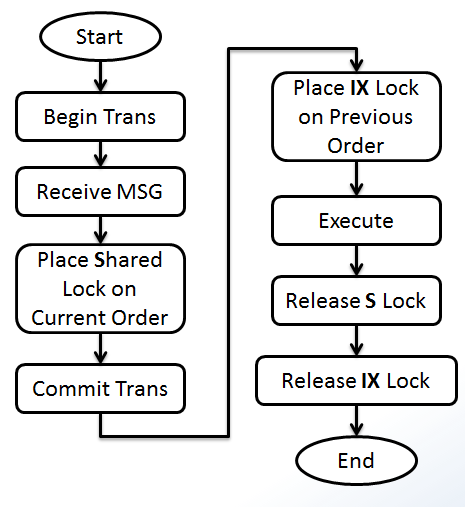 When a task is running, a lock on a resource is granted during the execution. Tasks with the same order are sharing the same lock resource (don’t conflict with each other). Tasks in the next order will share different lock resource but must be conflicting with the lock held in previous order. So, we need 2 type of locks conflicting with each other but does not conflicting itself. I use Intent Exclusive and Shared lock, because they don’t conflict with themself but do with each other. The process design of activator is illustrated. When an activatin procedure is started, a transactioin is issued. It starts receiving message (task). Once a message is received, a Shared lock is placed on current order before the transaction is committed. This prevent other activators from receiving tasks when a lock has not been granted to the first ( and only one) receiver. Once a shared lock is granted, this task is secured. It then checks whether or not it should start this task by checking existance of previous task by granting Intent Exclusive lock on previous order. If there is any tasks before current order, Shared lock must be on previous order, then the task in current order must wait until all Shared locks in previous order released. Once all required locks are granted successfully, the task can be launched. After it finishes, locks are acquired in that duration are all released. Another requirement of this design is when a message is received, we must know the order of previous task. This is simple. We can always embed that as part of the message. See the implementation below.